⚔ ☢ Serie på fem amerikanske atmosfæriske atomvåbenforsøg i Nevada forsøgsområdet i den første del af den kolde krig. Oplysninger om operationen er stadig skjulte som klassificeret information også selv om at forsøget er beskrevet detaljeret i Nuclear Weapons Testing at the Nevada Test Site, 2011. Forsøgene kom efter Operation Sandstone og fortsættes med Operation Greenhouse. Arkiv: National Archives: Records of the Defense Threat Reduction Agency, (Record Group 374), 1943-73. Se tillige: Operation Anvil ; Aqueduct ; Arbor ; Argus ; Bedrock ; Bowline ; Buster-Jangle ; Castle ; Chariot ; Charioteer ; Cornerstone ; Cresset ; Crossroads ; Crosstie ; Cue ; Dominic ; Dominic II ; Dugout ; Emery ; Fishbowl ; Flintlock ; Fulcrum ; Fusileer ; Greenhouse ; Grenadier ; Grommet ; Guardian ; Hardtack I ; Hardtack II ; Ivy ; Julin ; Latchkey ; Little Feller ; Mandrel ; Musketeer ; Newsreel ; Niblick ; Nougat ; Phalanx ; Plowshare ; Plumbbob ; Praetorian ; Project 56 ; Project 57 ; Project 58 ; Project 58A ; Quicksilver ; Redwing ; Roller Coaster ; Sandstone ; Sculpin ; Storax ; Sunbeam ; Teapot ; Tinderbox ; Toggle ; Touchstone ; Trinity ; Tumbler-Snapper ; Upshot-Knothole ; Whetstone ; Wigwam. 'This report is based on the military and technical documents associated with the Operation RANGER atmospheric nuclear weapons tests. 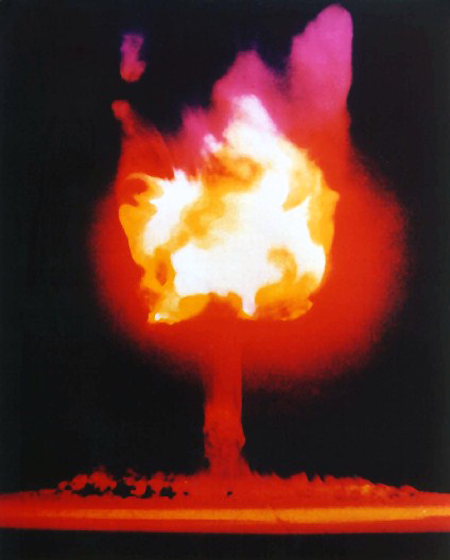 Many of the documents pertaining specifically to DOD involvement in Operation RANGER, the first series of atmospheric nuclear weapons tests conducted at the NPG, were found in the Defense Nuclear Agency Technical Library, the Air Force Weapons Laboratory Technical Library, and the Modern Military Branch of the National Archives' s. 8. Department of Energy: Nuclear Test Film - Operation Ranger, Operation Buster/Jangle (1951).